The long leading forecast continues to hover just above neutral, but the overall theme is one of slow deterioration. 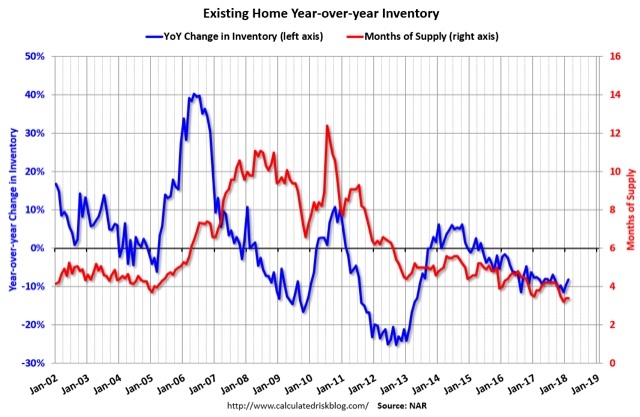 February new and existing home sales: signs of stress? There's a real disconnect between the market for new and existing homes. To cut to the chase, while sales of new homes have continued to increase, even in the face of higher mortgage rates, those of existing homes have stalled. In the below graph, I have normed both series to 100 as of July 2015. While sales of new homes (red) are roughly 25% higher than over 2 years ago on a three month rolling average, existing home sales are only about 2% above that level! One way to look at this is to in terms of the monthly carrying cost of housing. There is probably at least another 10% to go before these rise near their 2005 bubble levels. With a few months' exception, sales have not been keeping pace with construction. Since the recent increase in mortgage rates hasn't really filtered through yet, this situation is likely to deteriorate further rather than to improve. There has been an inversion in the *direction* in which yields in long vs. short term bonds are moving. I examine this over at XE.com. A major element of the participation rate is comparison with other alternatives to being in the labor force. Two alternatives to labor participation appear to have had a significant effect on the rate. 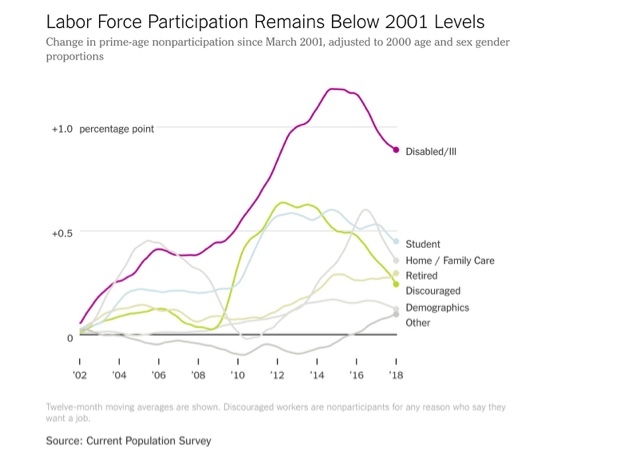 First, the cost of child care, which has soared over the last 15 years, compared with subdued (or paltry) wage growth has caused many women and some men as well in the prime age demographic to leave the labor force completely and instead raise their children as homemakers. 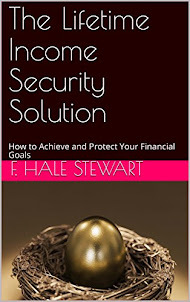 A second alternative, which appears to be a major determinant of the decline in male participation at least over the last 60 years is the expansion of disability insurance. This increase in disability has been mainly due to neck and back conditions, and together with improved longevity, has increased the incidence of long-term disability dramatically. It has also been suggested that the huge increase in the incarceration rate from roughly 1980 through 2000 has also played an important role in depressing participation. The data shows that the decline has come almost entirely from the older half of the prime age population. As Spock might say, "fascinating." Last Friday's JOLTS report for January included some important revisions, particularly with regard to hiring. So let's take a closer look. I pay little attention to "job openings," which can simply reflect that companies trolling for resumes, or looking for the perfect, cheap candidate, and concentrate on the hard data of hiring, firing, quits and layoffs. Note that hiring had just gotten around to equalling its peak from late 2015. Our update graph shows hiring exceeding its prior peak in the third quarter and clearly establishing a new high in Q4 2017. That is unequivocal good news, since in the last expansion, hiring was the first metric to peak. The positive trend in both hiring and total separations is clear. With hiring increasing in the past few months, I expected the number of voluntary quits to improve as well, and they have:again, if the pattern from the last decade holds, I would expect quits to improve somewhat as well. As in the last business cycle, quits are still rising. The only divergence is that involuntary separations remain off their bottom. 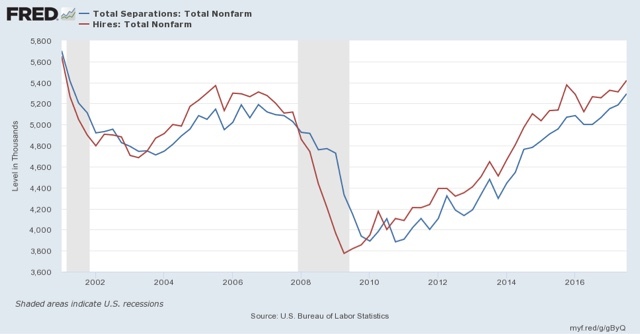 So while I continue to watch to see if hiring stagnates,the new highs in hiring are a very positive sign, consistent (though not necessarily) even with being before mid-cycle. In the wake of Conor Lamb's election victory in Pennsylvania last Tuesday night, some Democratic partisans are suggesting that every GOP-held seat from a district that is less than trump +20% is in play. Hold your horses. The results of last June's special election in Georgia, in which GOPer Karen Handel defeated Democrat Jon Ossoff show that there is a roadmap to the GOP minimizing their losses in this November's midterms. Democratic turnout in the PA special election approached that of Presidential election levels, while GOP turnout was much smaller. Simple point: when D's turn out, and R's don't, D's win. 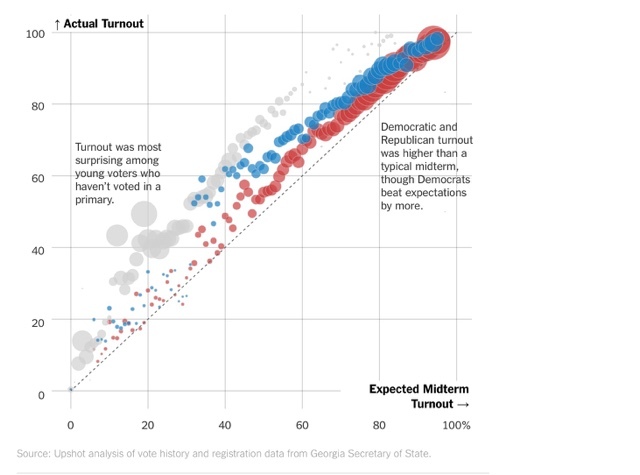 What is noteworthy in this graph, and a point that was made at the time, is that it wasn't only Democratic turnout that exceeded the levels of the last state election. GOP turnout was *also* higher, although not by nearly so much. 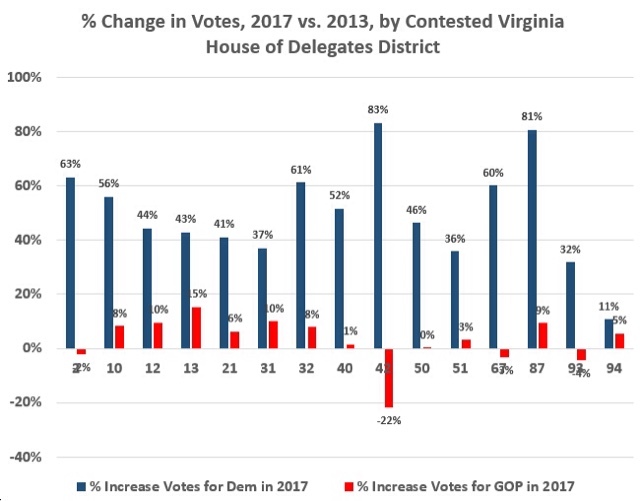 Even so, that slight increase in GOP turnout was enough for them to hold on to the Virginia House of Delegates (literally, by one vote!) even though more votes were cast statewide for Democratic candidates, by a margin of 54%-46%. ... [I[t wasn’t because Democratic voters didn’t show up. More than 259,000 votes have been tallied as of Wednesday afternoon, considerably more than the 193,000 votes in the first round of voting in April. Cahaly added that, in his view, Handel and Republican outside groups also drove turnout by nationalizing the race. At the same time, they probably will use social media accounts to try to drive down Latino turnout by arguing that the Congressional Democrats sold out Dreamers (as to which there is at least some merit). If so, the vote in Congressional districts and Senate races is likely to come closer to mirroring that from 2016. That strategy probably concedes that GOPers will lose any Congressional districts that voted more for Hillary Clinton than Trump. But under that result -- even one in which Democrats "win" the number of ballots nationwide by something like 53%-47% -- the GOP nevertheless retains control of the House and Senate. While as I pointed out several weeks ago, demographics alone should make the electorate less reddish, people shouldn't get carried away with over-optimism.